Offspring International offers a comprehensive designed package, tailored to suit individual location requirements and water temperatures. OIL’s full range of Single Point Mooring products is manufactured and supplied in strict accordance with the OCIMF 2000 and 2007 “Guidelines for the Purchasing and Testing of SPM Hawsers”. Our SPM product range offers outstanding operational performance, reliability, safety and on-time delivery. • Marine hose ancillary equipment. 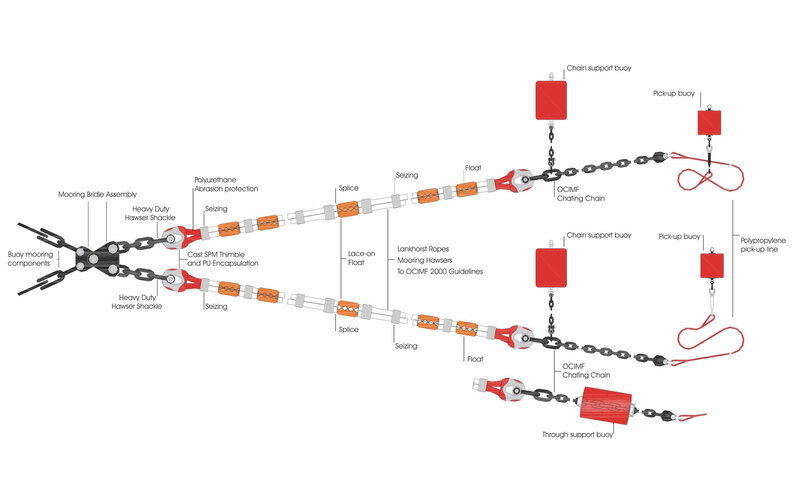 Offspring International supplies a range of single point mooring offtake systems including the typical dual hawser configuration shown above, single leg type mooring hawser and grommet type mooring hawser. As part of our total commitment to quality and service, our Sales Engineering support team is able to provide invaluable technical support to all our customers. This far reaching service can extend from advice given over the telephone regarding the most suitable system for your individual requirements, to visiting operational terminals around the world, with recommendations given at first hand to ensure the most cost effective solutions to in-service problems. The latest Computer Aided Design and DeskTop Publishing technology allow us to produce “As Built” drawings and fully documented manuals for any mooring system to accompany the QA and/or independent inspection authority certification. The Lankhorst Ropes Technical Department, responsible for research, design and development, product engineering and quality data management, is manned by highly qualified engineers and inspectors. In addition to a fully equipped chemical laboratory for forensic analyses, we have direct access to in-house computer controlled testing equipment to evaluate, reverse bend, elongation, abrasion, tensile loading of yarn and fibre ropes with a load capacity up to 1200 tonnes.